Miter gears are a special class of bevel gears where the shafts intersect at 90 degrees and the gear ratio is 1:1. KHK stock miter gears are available in two types, spiral and straight tooth, with high precision grade for demanding torques and speeds, and commercial grade for economical applications. 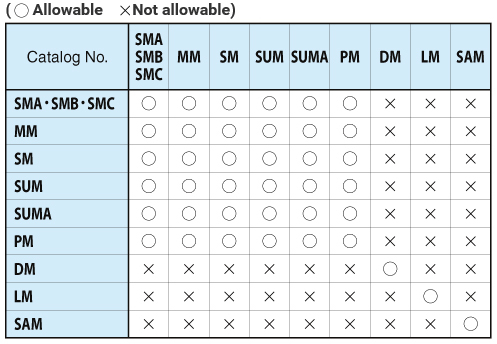 The following table lists the main features for easy selection. Features : High strength, abrasion-resistant and compact for high speed & torque use. Features : Reasonably priced ground gear, yet remachinable except for the gear teeth. Features : Superior performance with regard to high speed, low noise, and low vibration. Features : Ready to use without performing secondary operations. Strong and abrasion resistant. Features : Only teeth are induction hardened, allowing user to perform secondary operations elsewhere. Features : Large numbers of teeth and modules are offered in these affordable spiral miter gears. Features : A spiral miter gear with a helix angle less than 10°. Receives forces from the same direction as straight miter gears receive and have excellent precision properties.. Features : Usable without remachining, offered in 3 bore sizes. Features : Compared to SM miters, these are stronger and less abrasive, and allow secondary operations. Features : Mass-produced, low cost sintered products. Small and light weight. Features : Popular straight miter for many uses. 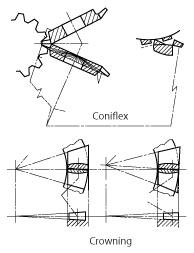 Features : 3 types are available for shafts at 45 Deg, 60 Deg and 120 Deg. Features : Suitable for food machinery due to SUS303’s rust-resistant quality. Features : Stainless steel products, usable without remachining. Features : MC nylon products are light and can be used without lubricant. Features : Injection molded, mass-produced products, suitable for office machines. [NOTE 1] Although these are carburized products, secondary operations can be performed as the bore and the hub portions are masked during the carburization. However, as a precaution, high hardness (HRC40 at maximum) occurs in some cases. 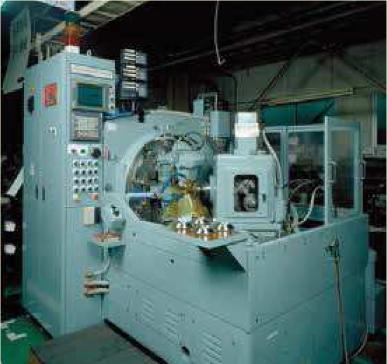 KHK utilizes Gleason Coniflex No.104, 102 and 114 bevel gear generating machinery, also equipped for mass production of straight miter gears. You can count on a stable supply of economically priced straight miter gears from KHK. Please select the most suitable products by carefully considering the characteristics of items and contents of the product tables. It is also important to read all applicable “CAUTION” notes shown below before the final selection. Among KHK stock miter gears, there are products which are not interchangeable even when the module and the number of teeth are the same. Also, spiral miter gears require additional consideration since the right-hand mates with the left-hand spiral as shown in the table below. [CAUTION] For selecting items in the “Allowable in certain cases” category, please reconfirm with your nearest KHK dealer that the pair can work. The gear strength values shown in the product pages were computed by assuming a certain application environment. Therefore, they should be used as reference only. We recommend that each user computes their own values by applying the actual usage conditions. 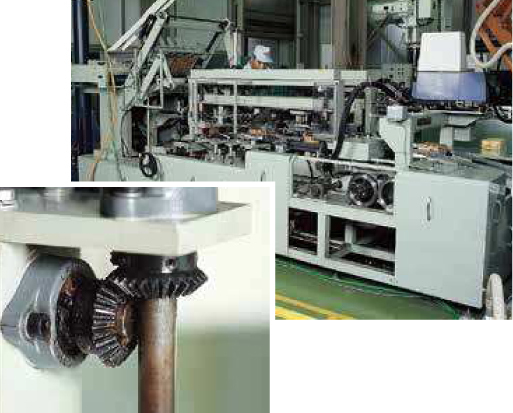 To learn more about the strength calculations, please refer to the technical information contained in the “Bending Strength of Bevel Gears” section on Page 87, and the “Surface Durability of Bevel Gears” section on Page 93. [NOTE 1] The gear strength formula is based on JGMA (Japanese Gear Manufacturers Association) specifications, “MC Nylon Technical Data” by Nippon Polypenco Limited and “Duracon Gear Data” by Polyplastic Co. The units for the number of rotations (rpm) and the the stress (kgf/mm2) are adjusted to the units needed in the formula. [NOTE 3] The values of the allowable bending stresses for DM m1.5 and the allowable root bending stress for LM gears are our own estimates. In order to use KHK stock gears safely, carefully read the Application Hints before proceeding. If there are questions or you require clarifications, please contact our technical department or your nearest distributor. If you are reboring, it is important to pay special attention to locating the center in order to avoid runout. The reference datum for gear cutting is the bore. 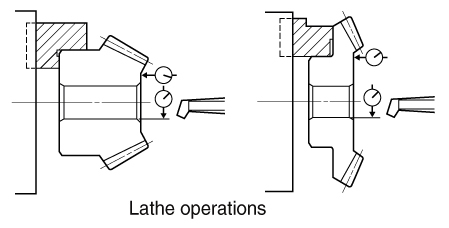 Therefore, it is best to use the bore for locating the center. If it is too difficult to do for small bores, the alternative is to use one spot on the bore and the runout of the side surface. 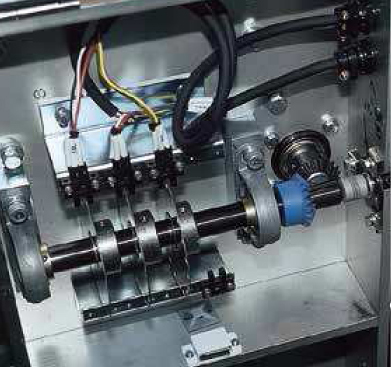 If reworking using scroll chucks, we recommend the use of new or rebored jaws for improved precision. Please exercise caution not to crush the teeth by applying too much pressure. Any scarring will cause noise during operation. For items with induction hardened teeth, such as SMSG and SMS series, the hardness is high near the tooth root. When machining the front face, the machined area should be 4 to 6mm smaller than the dimension, J. For tapping and keyway operations, see the examples given in “1. 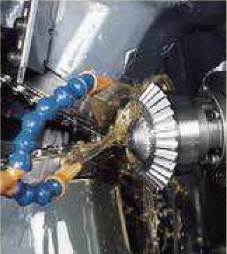 Caution on Performing Secondary Operations” in KHK Stock Spur Gear section. When cutting keyways, to avoid stress concentration, always leave radii on corners. 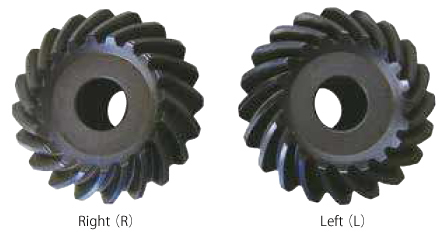 PM plastic miter gears are susceptible to changes due to temperature and humidity. 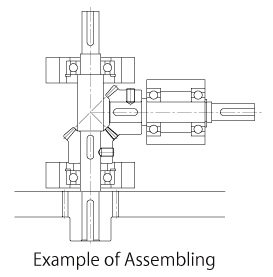 Dimensions may change between during and after remachining operations. When heat-treating S45C products, it is possible to get thermal stress cracks. It is best to subject them to penetrant inspection afterwards. If tooth strength is not sufficient, it can be increased approximately four times by heat-treating. On the other hand, the precision of the gear will drop about one grade. 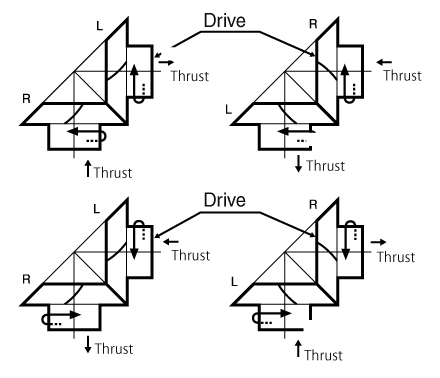 to handle these thrust forces. For more technical information, please see the section “Gear Forces” (Page 107) of separate technical reference book. abnormal noise and wear, and may even cause fatigue failure of the shafts. Both shafts and bearings must be designed with sufficient strength. Due to the thrust load of miter gears, the gears, shafts and bearings have the tendency to loosen up during operation. 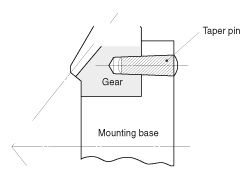 Miter gears should be fastened to the shaft with keys and set screws, taper pins, step shafts, etc. When installing MMSA or MMSB finished bore spiral miter gears in B7 style (ring type), always secure the gears onto the mounting base with taper pins to absorb the rotational loads. It is dangerous to secure with bolts only. KHK stock miter gears are designed such that, when assembled according to the specified mounting distance with a tolerance of H7 to H8, the backlash shown in the table are obtained. Mounting distance error, offset error and shaft angle error must be minimized to avoid excessive noise and wear. Inaccurate assembly will lead to irregular noises and uneven wear. Various conditions of teeth contact are shown below. 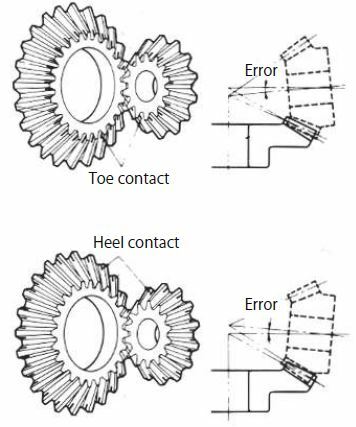 When assembled correctly, the contact will occur on both gears in the middle of the flank and center of face width but somewhat closer to the toe. 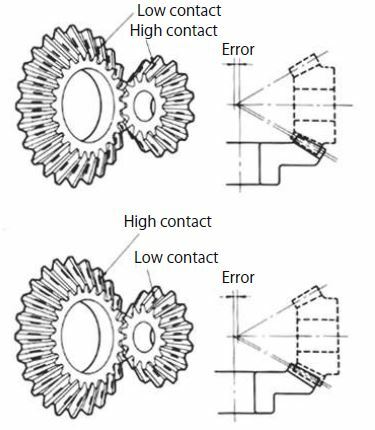 When the mounting distance of the pinion is incorrect, the contact will occur too high on the flank on one gear and too low on the other. 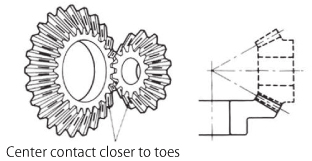 When the pinion shaft is offset, the contact surface is near the toe of one gear and near the heel of the other. 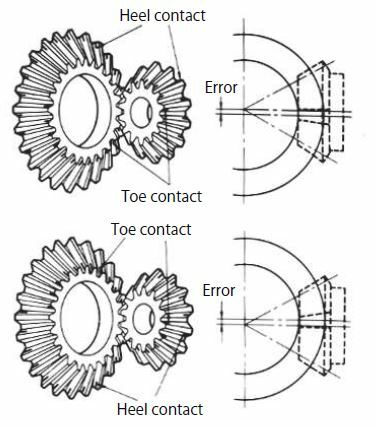 When there is an angular error of shafts, the gears will contact at the toes or heels depending on whether the angle is greater or less than 90 Deg. View this video to learn about KHK’s advanced gear manufacturing process. Copyright© 2015 Kohara Gear Industry Co.,Ltd. All Rights Reserved.